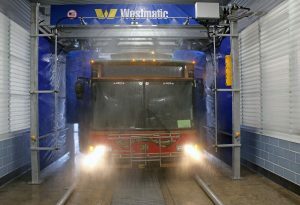 New operations and maintenance facility features Westmatic’s 4-Brush Drive-Through Transit-Master bus wash system. Westmatic’s 4-Brush Drive-Through Transit-Master is ideal for CATA’s mixed fleet and provides a safe and effective way of washing above and around bike racks. A set of full length vertical brushes wash the sides and rear of the vehicle while a second set of half-length brushes wash above the front mounted bicycle rack. The system also features a pre-soak arch to provide additional cleaning, and a chassis and wheel wash to remove road salt, dirt, oil and other materials that can build up under the vehicles. The vehicle drying system removes excess water which is captured by the water recycling system as the bus exits the wash system. The water recycling systems uses cyclonic separation to achieve water quality of 10 microns. Odor control is achieved by use of ozone injection, which safely and effectively eliminates any odor-causing bacteria which is especially important in CATA’s enclosed wash bay design. Ozone injection also accelerates solids precipitation. This process enables water reclamation of up to 85%, reducing sewer impact fees as well as monthly bills. CATA provides transit services to a wide area of rural Pennsylvania and last year, topped 400,000 passenger trips.